through action dialogue and change.. The Carma House is in a small village located in Léogane Haiti about 90 minutes outside of Port-Au-Prince. Decades ago Melky’s father adopted this orphanage and made it his mission to help these children. The Carma Makeovers assure that women are given a much deserved day of pampering. We may not be able to solve all their problems, but if we can turn their frowns into smiles. 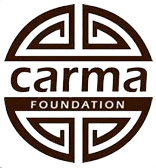 The Carma Foundation’s Community Outreach Program focuses on helping underprivileged children meet their dreams. The Carma Foundation Entrepreneurship Initiative’s goal is to empower youth by helping young entrepreneurs get there business started along with helping existing entrepreneurs to grow their current business. We at the Carma Foundation believe that education is an important tool to help escape poverty and that is why we created the Carma Foundation Scholarship Fund. Carma has successfully delivered shoes to over 20,000 people in need. One of the first projects Carma foundation embarked on was putting a pair of shoes on all of the children’s feet in Haiti.